The Quilted Coco Mat Mattress is handmade in Devon using organic materials which are naturally breathable and self-ventilating. This helps baby regulate their body temperature and sleep comfortably. The central ingredient is coir, the husk of a coconut, which is a naturally supportive and breathable fibre. It offers the perfect firm support required for newborns to sleep safely. A breathable mattress is also essential for babies as they cannot easily regulate their own body temperature. Organic lambswool surrounds the coir to provide softness and insulation. Lamsbwool is well suited to baby mattresses as it traps heat when your child needs it and disperses it when it gets too warm. The naturally antimicrobial lambswool is bathed in essential oils of lavender, lemon and eucalyptus to remove dust mites making it ideal for babies with allergies or asthma. A quilted 100% pure cotton cover adds softness and comfort and is unbleached and undyed for peace of mind. The cover is also removable and machine washable at 60°C (dust mites are killed at 57°C) for conveinence and to help keep the mattress heathly. All ingredients in the Quilted Coco Mat are responsibly sourced with coir from an organic certified farm in Sri Lanka and organic lambswool from Soil Association certified farms in Devon, Dorset and Cornwall that are all local to Naturalmat. The mattress is chemical free, non-toxic and naturally fire retardant. The Quilted Coco Mat is available in a variety of sizes including cot and cotbed and is also available in bespoke sizes through the made to measure service. This option is perfect for parents who have an usual sized baby bed or moses basket from any brand or a much loved family cot. The made to measure service can also be used to create mattresses for pushchair carrycots and travel cots so babies can enjoy natural comfort on the go. Considering how much time your baby will spend asleep and for how many years they will sleep in their bed, finding a great quality mattress is one of the most important things you will need to find and we feel this mattress is one of the best mattresses on the market. 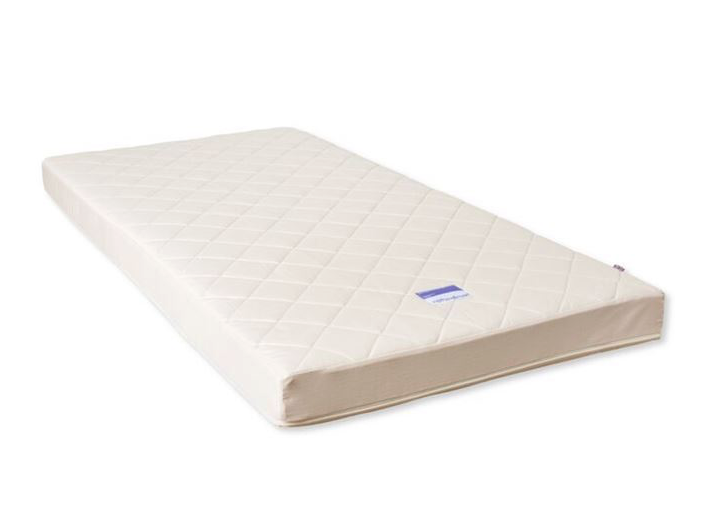 Having looked at quite a few mattresses over our time we could straight away tell this mattress was not only amazing quality but was going to be really comfortable for baby. We not only love the fact that it is completely natural and 100% safe for baby to sleep on but it also has so many great selling points such as the fact that it is suitable for babies with allergies and asthma and it has a removable cover that can be popped in the washing machine. We feel this mattress is worth every penny and could not recommend it highly enough, it will last your little one from birth right up until they graduate to a big bed.